Newtown’s hearts were broken by a last gasp Bala town winner after battling for so long with ten men at Maes Tegid. Chris Venables headed his side in front early on, before Steve Leslie leveled from the spot within minutes of the re-start. A flash point came when Craig Williams was given a second yellow card, and soon after Nathan Burke went down in the box with Venables lashing home the resulting penalty. 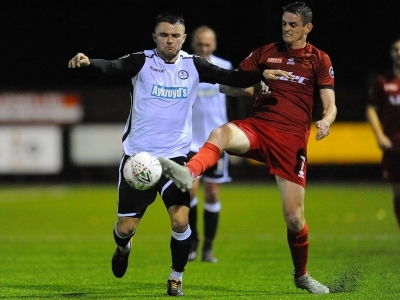 Despite having ten minute, Luke Boundford got Newtown level with a header six minutes from time, but Robins hearts were broken as Bala stole the victory in injury time, as Joe Kenton turned through his own net. Chris Hughes opted for one change, as Leslie returned to the line-up in place of Sam Phillips. 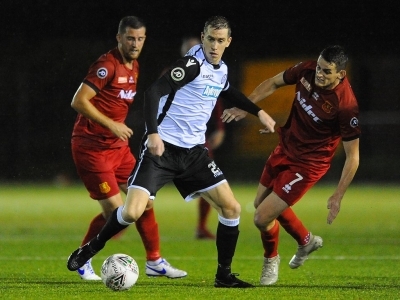 The wet and windy weather battered Maes Tegid in the run up to kick off, but the 3G surface meant the game was never in doubt. It was a high intensity game to begin with, as both sides tried to get it down and play. Then Bala had a flurry of chances and took one to take the lead. 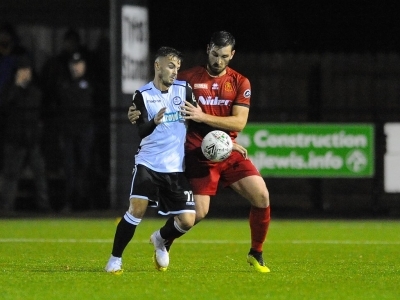 Henry Jones was denied by Kieran Mills-Evans from a narrow angle, before the midfielder crossed for Steve Tames but Craig Williams denied his goal bound header. Then from the resulting corner Chris Venables lost his man, to power a header home at the front post. Newtown tried to hit back with a response as a Williams free kick saw Mills-Evans get something on it, but it went way wide. 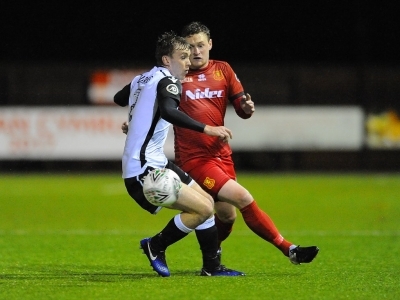 The Robins began to press before the break as Mills-Evans headed over again, before dangerous crosses from Callum Roberts and Leslie began to cause problems. Venables went closer to a second just before the break, but Dave Jones was equal to his curling effort. Then in stoppage time Roberts had a chance to test Bala stopper Ashley Morris, however he curled his free kick wide. The Robins needed a quick goal to get back in the game and they got it within three minutes of the re-start. Neil Mitchell turned his defender in the box, and was taken down with referee Lee Evans taking his time before pointing to the spot. Leslie stepped up and Morris guessed right but the penalty had too much on it and found the corner. Mitchell saw a long range goal bound effort just tipped over, with Nick Rushton seeing a shot from the resulting short corner deflected over. Just as the Robins were building up ahead of steam, they suffered a major set back as skipper Williams received a red card. Already on a booking, he mistimed a tackle and took down Sean Smith, with referee Evans showing a second yellow card. Rushton almost handed Newtown the lead as went to chip Morris, but the keeper back peddled and tipped it over. 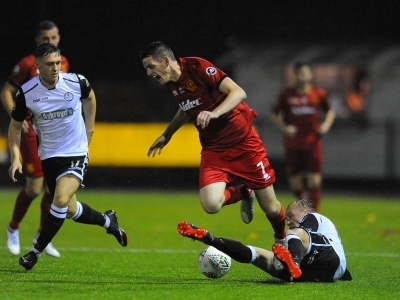 The Lakesiders began to turn up the heat on the ten men, and they held firm until Nathan Burke was bundled over in the area, and another spot kick was given. Venables stepped up and sent Jones the wrong way and restore Bala’s lead. 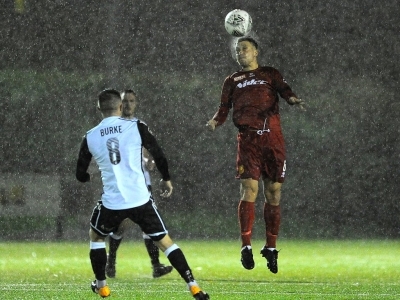 The rain got even heavier in Denbighshire, and Bala almost went two in front but Jones denied Burke from close range. They were looking more likely to get a third, but out of nowhere the Robins broke and got themselves level. Substitute Ethan Jones found Roberts out wide and he crossed for the back post, where Boundford powered a header past Morris. Bala turned up the heat as Newtown tried to sit in and soak up the late pressure, but it told in the last minute. Jones weaved his way through and a ball across the box was turned into his own net by Kenton.